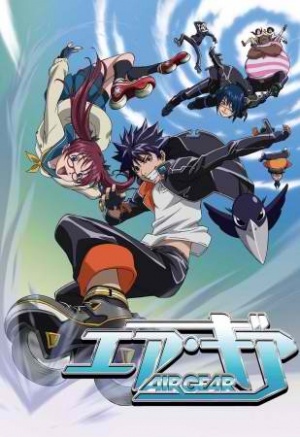 Air Gear is a manga by Oh! Great that was serialized in Weekly Shonen Magazine. It later had an anime series by Toei Animation with a sequel OVA series by Satelight. John Omaha who had switched bodies with Emily Adachi is seen coming out of the bathroom in a Towel after an Off Screen Bath in a Clawfoot Bathtub. There is a Furo scene with Ringo Noyamano, Mikan Noyamano, Rika Noyamano and Shiraume Noyamano. Itsuki Minami takes a Bath in an Undermount Bathtub and gets interrupted by Simca who attempted to bathe with him. Akito Wanijima has an Off Screen Bathing scene. There is a Public Bath scene with many unnamed females, Ringo Noyamano and Rika Noyamano. Itsuki Minami falls into the bath house clothed. There is a Bath scene with Itsuki Minami and Akito Wanijima in an Undermount Bathtub. Akito Wanijima is seen in a Dream Sequence Bathing scene. Mikan Noyamano takes a Bath in an Undermount Bathtub. Itsuki Minami takes a Bath. This page was last modified on 10 July 2018, at 14:08.